The 2016 Year End Promotion is Now On! 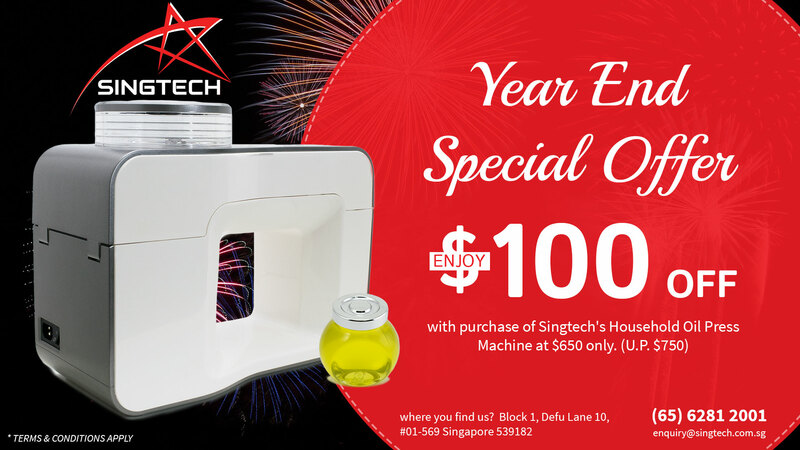 From now till 31th December 2016, enjoy $100 discount off our Household Oil Press Machine! Purchase our Oil Press Machine at $650 only (U.P. $750). Introduce your family and friends to a world of health with our Household Oil Press Machine. Small but powerful, our electric Oil Press Machine is capable of extracting oils from different seeds, nuts, fruits and plants efficiently and effectively. No more tiresome hand pressing of oils using a manual oil press. Our Oil Press Machine is able to extract oils with just the touch of a button. All you have to do is place your raw ingredients into the machine and it will do all the hard work for you. To enjoy the discount, simply add Healthy Oil Press Machine to your cart. Singtech (Healthy Oil Press) never provide the shipping for customers who purchase through Healthy Oil Press website. Customers have to collect it at Singtech office (Block 1, Defu Lane 10, #01-569 Singapore 539182). This promotion is valid till 31th December 2016. Singtech (Healthy Oil Press) reserves the right to amend or terminate the promotional mechanics without prior notice to the customer. Items sold are strictly non exchangeable, refundable nor returnable. Feel free to call us at +65 6281 2001 or email us at [email protected] if you have any enquiries.